Sports style personalized wedding bobble head doll - a love more than a gift! 1, 100% head-to-toe customized.Only need 77USD, no need any mould fee. 2, During proofing process, it is not limited to modify the proof many times until you are completely satisfied. 3, We have built the factory over 10 years. We use the best material and have most senior sculpture team. Most of our dolls are between 6.5 Inch (Free) - 9.6 Inch. Sizes can vary as all of our pieces are hand made. Dolls can be shipped worldwide. After order, shipment can be made in 3 to 20 days to your options. Usually you can receive it in 3 days after shipment. A wedding is one of the most important 'Rites of Passage' that a couple goes through. Not only is it a move into a new phase of life, but it is also a deep commitment between two people who are in love. 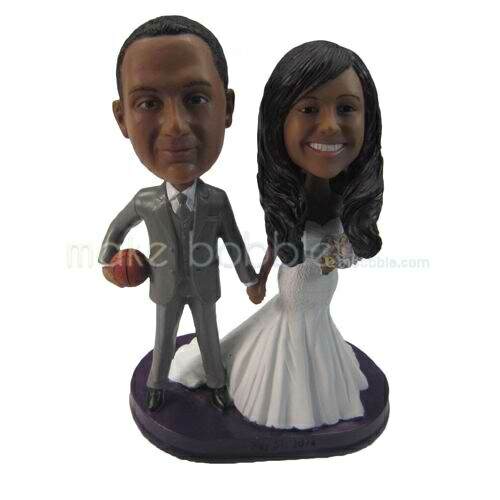 A wedding Bobblehead can grace the top of the wedding cake and later can be on display as a constant reminder of that glorious day and of continuing happiness as the couple goes through life. Receive Before: * E.T.A, Base on customer approve within 24 hours. If you want to change the clothes color, please describe here.